LED Super Screens are an ideal solution for your hotel, pub or night club to greatly enhance the entertainment value for your clients. Patrons will often choose a venue with a large video screen over one without, especially when gathering to watch sporting events. A super screen in your venue also provides a medium to promote advertising and can provide constant video entertainment such as Nightlife or music video clips from your Jukebox. LED Super Screens vastly improve the appeal of outdoor entertainment areas or beer gardens. Additionally smaller LED screens can be positioned as front signage to promote upcoming events at the venue. Not only do we provide outdoor video solutions, but we also have a high resolution 101" LED SuperScreen tailored specifically for indoor areas. Why spend $40k or more on a 100" plasma with a lifespan of 4 years when for much the same money you could be installing a 101" LED SuperScreen with a lifespan of 10 > 15 years! A Super Screen is an excellent way to provide constant entertainment to your patrons when live entertainment is not available. LED super screens are perfect for watching sports, major events and any other TV program you think will draw a crowd. Our LED Super Screens use high quality LED's so you won't see any discoloration over time. And fast refresh rates mean high speed sports won't suffer from jitter or blur. Be aware, those last two points are important considerations when weighing up against cheaper brands. Our screens can be customised to suit most sized rooms and viewing areas. They're the clear choice for outdoor entertainment and are just as effective during the day or night. A big benefit of LED is their very wide viewing angles, perfect for odd shaped rooms or irregular viewing areas. Stay ahead of your competition and install an LED Super Screen into your pub or club. With the best in Big Screen Video technology you will be sure to be the first choice for local patrons. 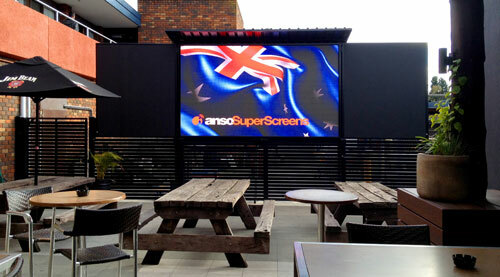 Contact ANSO SuperScreens today and find out how we can bring bigger crowds into your venue!